As one of the greatest classics of English Literature, Hamlet has been not only remade in every possible way, but the subplots and characters of the tragedy have spawned many stories of their own. Ophelia's story, though, has really remained underappreciated. She loves Hamlet and seeks to console him as he grows mad, and then goes mad herself and finally kills herself. BUt her name has spawned an entire metaphor for adolesecent femininity. Thus, it is only in small irony that it should all come round and Ophelia's own story should become the subject of a YA book. 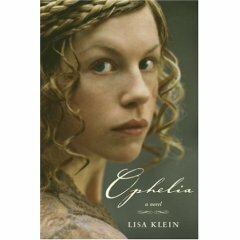 This novel picks up many years before the Bard's Hamlet, and continues for many years after -- a subject of some confusion as Ophelia dies in the more well-known version of events. And between this back story, the tale that follows, and a different viewpoint on the events in Elsinore, we get a story that expands upon Hamlet, adding details that change no fact of the narrative but which cause us to rethink the meaning of the tragedy itself. It will probably shock the more cultured people to hear me say that I always picture Helena Bonham Carter in this role (as it is Mel Gibson's Hamlet that I most clearly remember). So, I'll take a special delight in seeing her story expanded and I enjoyed this novel a great deal. All of which is not to say that I think this is a perfect book. I found the after story (the last 100 pages or so) to be completely unnecessary. It added so little to the understanding of Ophelia. If anything, it cheapened her a little by adding political correctness and anachronistic visions of gender roles to her character. But I understand Klein's purpose in doing so (having Ophelia's life end as a suicide was such a dramatic disappointment). I think this novel can serve two purposes: it can serve as an entertaining novel in its own right, or it can help readers appreciate Hamlet more, opening up an interpretation of that story that might otherwise go uncovered. Fascinating!